Here's how to trade the names that are actually higher as the market sells off. It's proving to be an ugly day for the market. As of this writing, all major stock market indices are down at least 1.5%, dragging stocks to the lowest levels seen since the start of this summer. Simply put, the price action we're seeing in the broad market Tuesday doesn't paint a particularly rosy picture for stocks' staying power during the rest of 2018. But while Mr. Market gets gut-punched this week, there's a different story playing out in a few of the most actively traded stocks on the market. To figure out which stocks are actually working in this market environment - and how to trade them - we're turning to the charts for a technical look. Verizon is up more than 3.4% Tuesday, rallying following third-quarter earnings that beat estimates. That's a substantial earnings reaction - and the scale of the move has a lot to do with Verizon's technical setup heading into October. Since the middle of August, Verizon has been setting up an ascending triangle pattern, a bullish continuation setup that's formed by horizontal resistance up above shares at $55, with uptrending support to the downside. 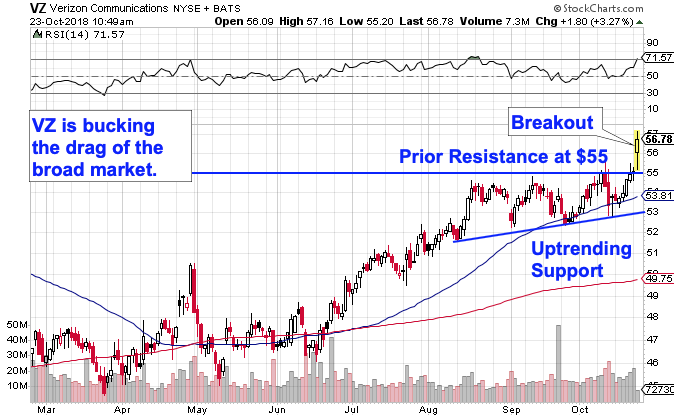 Simply put, Verizon's big breakout through $55 today clears the way to more upside ahead. From a risk-management standpoint, the 50-day moving average has started acting like a decent proxy for support - that makes it a logical line in the sand to park a stop below. 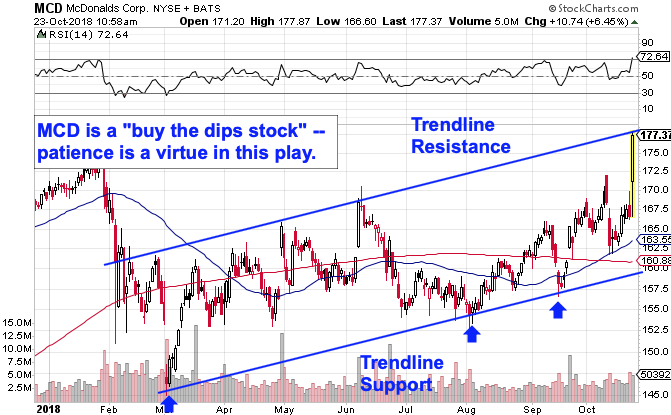 As long as Verizon continues trading at or above the 50-day, buyers remain in control of things. Like Verizon, McDonald's is up big - more than 6% at some points Tuesday - following strong quarterly performance numbers. And also like Verizon, McDonald's surge higher comes on the heels of a bullish technical setup that's been months in the making. You don't need to be a trading expert to spot the price setup in McDonald's here. Shares have been moving up and to the right for months in a very well-defined uptrend, bouncing higher on every test of the bottom of their price channel. Now, today's rally is pushing McDonald's right to the top of that high-probability range for shares. The fact that this stock is up at the top of its price channel means that investors should exercise some patience before trying to pull the trigger on the McDonald's trade - shares could move lower before they move higher again. Still, the key message here shouldn't be missed: McDonald's is a defensive, buy-the-dips stock that's working in this corrective environment. Finally, there's gold miners, measured by the VanEck Vectors Gold Miners ETF (GDX - Get Report) , a popular exchange-traded fund that's one of the most actively traded issues on the NYSE this week. It shouldn't come as a surprise that gold is looking attractive in light of a risk-off move in the markets - or even that GDX is rallying, following a textbook bullish reversal pattern that triggered a technical buy signal earlier this month. The important thing to note is that a flight to quality could actually accelerate the uptrend that's already been occurring in gold miners this fall. That's good reason to keep an eye on GDX as well as on the individual names in the industry this month. 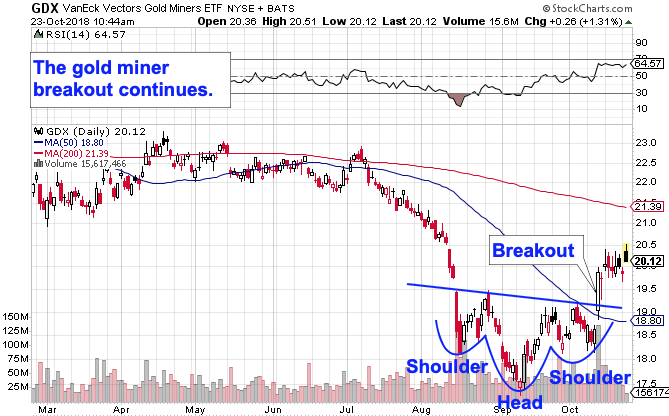 GDX looks ready to continue moving up and to the right in the intermediate-term.